The best way to watch Pearl is the way it wasn’t intended to be seen: in VR. Ironically, that version won’t be Academy-eligible. There are films that make you feel like a kid again. There are films that make you feel the invincible freedom of your teenage years. And there are films that capture the pangs of parenthood. Pearl manages to do all at once–in about six minutes. The latest short from Google’s experimental filmmaking lab Spotlight Stories–which is composed of alums from Pixar and Dreamworks–Pearl is the story of a little girl growing up with a struggling, traveling musician for a father. Set completely inside and around a car, the duo drives across the U.S. in their 1970s sedan, dad in the front seat, daughter in the back, playing the same song (a catchy folk ditty called “No Wrong Way Home,” composed by Alexis Harte and JJ Wiesler) for anyone who will listen. The girl grows up, meets new friends, gets in trouble, and forms a band of her own. The dad grows old, sells out, and never regrets a minute of it. Director Patrick Osborne, who won an Oscar for directing the Disney short Feast in 2015, pitched Pearl as Shel Silverstein’s The Giving Tree on four wheels. Told through a cel-shaded aesthetic with lots of music but no dialog, Pearl almost feels like a music video produced by Disney, but Osborne places the viewer right inside the car with the characters, so you can look around to direct the movie with your own eyes. The result is one intimate story that can be experienced countless ways on countless devices, though I’d recommend the experience for where it seems destined to live, in full VR, where it’s proving VR movies can be just as powerful as conventional ones. Six minutes later, I pulled off the headset, biting my tongue to avoid tearing up in front of a half dozen creatives. Pearl was originally built for 360-degree YouTube, which works on your phone or inside Google’s Cardboard headset. Yet there’s no one version of the film that’s canon. The environment may follow a script, but it’s still a full 3-D world that’s rendered in real time, which gives it a lot of flexibility for new presentations across mediums. Osborne has since produced a 2-D theatrical cut of Pearl that played on the big screen at Tribeca. And in an unplanned experiment that worked out extraordinarily well, the team recently ported Pearl to the high-end HTC Vive VR system, which allows an even greater freedom of movement inside the car. His advice sounded like a gimmick. But six minutes later, I pulled off the headset, biting my tongue to avoid tearing up in front of a half dozen creatives on the project. I’d traveled across the country, across two lives, and back. And I no longer recognized the room I’d been sitting in. But what Osborne did want to do was to tangibly push the medium forward. Thus far, no Spotlight Stories film had featured hard cuts between shots, because in VR (and even in simpler 360-degree video), cuts feel different–like they’re physically transporting our bodies to a strange new place every time. This makes it hard to tell a story that’s expansive in time or setting. VR storytellers have approached the medium as if cuts would be impossible for an audience to stomach. It’s probably the largest problem in VR storytelling, period. Osborne’s solution was the car–a perfect setting for many of the design challenges of VR. Think about it. You sit in a car, just like you might sit with a VR headset on, so the sensation makes more sense to your body than pretending you have wings and floating you around an environment. Additionally, the car can be a conceptual anchor to changes in time and place. So the inside stays familiar, but the weather or environment out the window can change without it being jarring. Watching Pearl, I did find the first two cuts jarring–the story is told at the breakneck pace of a commercial, which takes you by surprise in a medium notorious for dropping you into a location you can explore at a snail’s pace. After the first two cuts, though, my brain had accepted the premise. And as I’ve rewatched the piece since, they’re no more distracting than the cuts of any Hollywood film. With the power of editing, Osborne takes the car from a summer night filled with fireflies to a frigid frozen winter to a golden sunrise without missing a beat. If you watch his earlier short Feast, you’ll actually see how he deployed a similar trick at Disney, fast-forwarding through a dog’s life by cutting together several shots by his food bowl. Setting the story inside a car also offered a device filmmakers refer to as “frame within a frame.” At times, Osborne found it frustrating to not have total control over how viewers would see the characters, given that they could be looking anywhere at any moment. Indeed, it’s probably the largest problem in VR storytelling, period. Normally, a director carefully chooses every shot you will see, making great efforts to zoom you out from a scene to establish a setting, or move the camera right into an actor’s face to capture the finest details of emotion. Inspired by films like The Graduate and The Searchers, Osborne used the car’s open doors and windows to outline the action. As a result, you might not always be looking in the perfect place to catch every nuance of the narrative–I drove executive producer Karen Dufilho-Rosen crazy by sometimes looking out the front window instead of at the characters in the back seat–but your eyes do naturally gravitate toward mini-scenes told within the frames. And even the most random moments of cruising down the interstate feel like they’ve been carefully composed just for you. If you watch Pearl on YouTube or Cardboard, you’ll sort of float right above the center console. You are, in essence, watching the story from the perspective of the car. When the team ported the short to Vive–a process that only took about a day initially to get running–they realized being in the car felt claustrophobic when you had more freedom of movement. Instead, they removed a character who sat in the passenger’s seat, and gave that space to the viewer by default. This point of view makes for a remarkably intimate viewing experience–one that’s even more vicarious than the average film. When the characters are excited, you aren’t just watching characters be excited. You’re sitting in a car with characters who are excited. Even though they don’t acknowledge your presence, you feel communal emotions by proximity. Remember a time when you were stuck in a car when mom and dad were fighting, or when a stupid joke between friends became inexplicably hilarious within the cramped quarters of the car? That’s what it feels like to be in Pearl. But if you watch with the Vive, you’re not confined to just the front seat. Taking Curtis’s advice, I’ve watched Pearl from the front and the back. I’ve stuck my head out the sunroof. One time, I couldn’t get the Vive working properly, and I was trapped outside the car for a viewing. Each place you sit is an entirely different experience. In the front seat, I empathize with the dad. I see each moment of the story through the lens of my own son growing older. From the back seat, I feel like a child again, naively out of control of the car’s (and by association, my family’s) destination. Viewing from outside the car is a more typical Hollywood film experience–maybe simply by the nature of seeing more of the characters in the frame at one time, and the fact that many typical car scenes are actually shot from the outside. And sticking my head through the sunroof while firecrackers are shooting out the window? It’s every dumb decision you made as a teenager who’d just gotten your license–pure exhilaration with no parents and no wits at 50 mph. Even in a story this long, it’s hard to account for every technical and design consideration that went into making Pearl possible. The Spotlight Stories team expanded to as many as 40 people–enlisting the visual effects firm Evil Eye Pictures–to complete the animation. The song was written with more than a dozen verses, and recorded over and over again from the studio to the street, to ensure the 360-degree audio matched the slightest visual edits that the animation team made. On the back end, Google’s own Spotlight Engine is processing everything you see in real time on smartphones. It wasn’t until the final weeks of a year-long project that the 29 scenes loaded fast enough to eliminate startling gaps of black between cuts. At an unnamed date later this year, Google plans to share Spotlight Engine for anyone to use. Animation studios are already building rich 3-D environments–they’re simply choosing the angles you see. As for its own cinematic accomplishments, Pearl‘s language of cuts and scenery is groundbreaking for the medium, but it may or may not represent the entire future of VR storytelling. Any video game creator would criticize its fundamental lack of interactivity. I didn’t miss that. But there’s far too much going on, even sitting inside this one tiny car, to catch it all in one sitting. Half a dozen viewings in, and I’m still discovering micro-moments I’ve missed–from plot devices like moving signs, to a few moving frames where the adult daughter flashes back to a child again. Such an approach makes the six-minute short eminently re-watchable, but I’m not sure it would work for a 90-minute film. Then again, I’m not certain that VR movies should last 90 minutes anyway. I muse with Osborne about whether the Pixars of the world will be tempted to build similar VR experiences. There’s little doubt in his mind. Animation studios are already building rich 3-D environments–they’re simply choosing the angles you see. Dropping a viewer into the scene is a slight technical challenge, but likely, a larger creative one. Meanwhile, directing in 3-D space is already on trend. James Cameron did it for Avatar. And Osborne is pitching his future projects by using virtual cameras that can display his villains in VR for optimal impression factor. Not having seen the theatrical version, it’s impossible to know how the “film” translates, let alone if I’ll agree with the countless small directorial decisions I would have (and did!) make differently. But I do suspect Pearl‘s music, pacing, characters, and aesthetic are so affective that I’d enjoy watching it on just about anything. “I’m glad it works and doesn’t feel cheesy,” Osborne says. “We’re always riding a little bit of that line in this realm–too sappy or nostalgic–but it works here. I’m happy with it.” He’s wrong, of course. 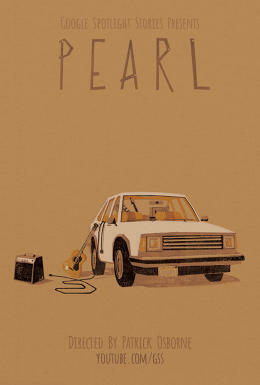 Like so many animated shorts packing a lot of emotion into a little time, Pearl is too sappy. And it is too nostalgic. But it absolutely still works. The tear-soaked padding on my silly Vive headset is proof of that.